Let me first say that the statistics for this book are mind boggling. The book has been out for almost two years and there are only 15 ratings and 5 reviews on Goodreads; that’s ridiculous! 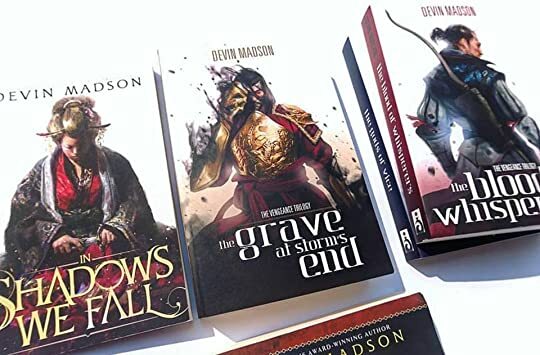 Not only is this trilogy better than a lot of grimdark series out there, Madson has done everything right as a self-published author. Amazing cover? Check. Great content? Check. Admirable professionalism? Check. The only thing this trilogy lacks is exposure and words of mouth. I’m not Mark Lawrence; I don’t have enough followers or friends on my list to bring as much exposure as he did for Senlin Ascends. I can only do what I do best and that is to provide my honest review/opinion and hopefully, it will help Madson’s work get the exposure it deserves. The Grave at Storm’s End marks the conclusion to Devin Madson’s Vengeance Trilogy. The flame of vengeance engulfs Kisia and the battle for the Crimson Throne will be decided once and for all within seven days. Think of this book like Joe Abercrombie’s The Heroes—where the entire book’s storyline revolved around a three day’s war—but instead of a standalone installment, imagine it as the culmination of a series with more background and buildup. I binged read this trilogy within six days, and this fact should go to show just how compelling and engaging Madson’s books were to read. As a concluding installment, the book managed to close every plot line with no loose ends; the ending was satisfying while leaving room for more spinoffs and new series (The first book in The Reborn Empire is already published) to take place in the same world. Madson truly delivers a fantastic conclusion to a trilogy that’s full of emotions. There wasn’t any superfluous content in the book; everything was efficient and conclusive, and the characters’ relationships hold the torch in heating the quality of the book to its max temperature. On my signed book, that quote was written by Madson and she totally nailed it. None of the characters ended up the same as they were at the beginning of the trilogy. So much development went into every character, not only the three perspectives characters but the side characters, too. The complexity imbued into the characters was awesome. Endymion, Darius, Katashi Otako, and Emperor Kin completely took the spotlight of the trilogy for me with their self-righteousness, overflowing hatred, and their need for vengeance that was insanely addictive to read. Almost all of the characters were out for each other’s throats and I realized that by the end of the trilogy, I really didn’t know who I was actually rooting for; the line between love and hate really blurs for the majority of the characters and because of this, they struggled a lot with their decision making. This created an unpredictable story progression and honestly speaking, some of the characters’ decisions were infuriating. However, when you truly put yourself in their shoes, you’ll also realize the conundrums they faced made their actions understandable. There were a lot of great scenes within the trilogy but I definitely have to give the top spot to The Errant scene in this book. The chapters surrounding the Errant scene were definitely the height of the trilogy in my opinion. It was intense, evocative, and each word seemed to have an underlying meaning which utterly grabbed my attention. I don’t know the details of the events that happened to Madson in real life between the publication time gap of the second book and this one; from the acknowledgments, I can only summarize that things hadn’t been easy for her. I do however know that the time gap made her prose even better. Madson’s prose here is of the same quality she demonstrated in her novella. The writing was meticulous, poetic at times, simple, and engaging. The story also felt better structured and the prose felt cleaner to read. As for the minor issue I had, it was the same as the one I stated in my The Gods of Vice review. The romance surrounding Hana and her tendency to switch lovers (although quite understandable considering her situation) was the only minor issue I had on the trilogy. Luckily, the romance never dominated the story and it didn’t end up ruining my overall experience. Remember, romance in my novel reading is one of my pet peeves as it VERY rarely works for me, so you might want to take this with a grain of salt. It could truly work for you because when it comes to character development, Hana actually received a LOT in this final book. I’ve seen Madson’s newest book, We Ride the Storm, receiving high praises from a few reviewers I trust and I’ll be diving into it immediately after posting this review. Reading The Grave at Storm’s End was a fiery, poignant, and emotional experience, one that I will definitely remember. With an ending comes a new beginning; I’m looking forward to finding out whether Madson will be able to top this book with her newest story.